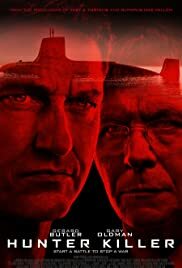 Director: Donovan MarshWriters: Arne Schmidt, Jamie MossStars: Gerard Butler, Gary Oldman, CommonSummary: A U.S. submarine, the USS Tampa Bay, vanishes while shadowing a Russian Akula-class submarine in the Arctic. Rear Admiral John Fisk sends a Virginia-class submarine, the USS Arkansas, under the command of newly-promoted and unorthodox Commander Joe Glass to investigate. At the same time, a Navy SEAL team under the command of Lieutenant Bill Beaman is sent in to discreetly observe a Russian naval base, but their mission is swiftly complicated when Martinelli, the team's new DM recruit, is rendered unconscious during the HALO drop. When they arrive at the naval base, they witness defense minister Dmitri Durov conducting a coup d'eta and taking Russian President Zakarin prisoner, and swiftly realize that Durov intends to trigger a war..